The Geek Culture Forums! : I ain't bluffing... it's a World Poker Tour Giveaway! Author Topic: I ain't bluffing... it's a World Poker Tour Giveaway! World Poker Tour is a hit TV sensation and helped fuel the current poker explosion. An estimated 60 million people in the U.S. now play and poker’s popularity continues to skyrocket. Available now through Shout! Factory or via Amazon, this eight-DVD boxed set features the top poker stars in the country as they compete for record-breaking prize pools, bluff opponents and show what high stakes poker is all about. Our second winner will take home a World Poker Tour game! All that is needed to play this gaming system are batteries and a TV -- no videogame consoles or gaming cartridges are required. 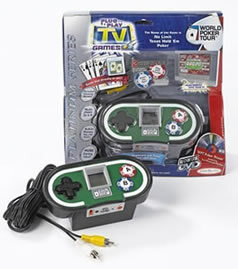 Simply plug the product into the A/V jacks of any standard television set, turn it on and play! Neat. So, how can you win? Easy! All you have to do is post a reply to this thread, and you're in on the giveaway. And, if you are a SuperFan, you can enter again here and get double the chance to win! We'll randomly draw names from the people who post, and they will be our lucky winners. Congrats folks, and thanks to all who entered. Stay tuned, there's another giveaway coming up on Monday! first post! ... er.. wrong board. Poker queen over here! Give it to me! Okay, I'll toss my hat in here too. Still won't win though. My wife loves poker. If I win, I'll give it to her. The key to poker is to look like you know a little more about the rules than your opponents. "You may have a royal flush, but I have a low-ace-high-two combo!" That's my sort of bluffing. I love to play poker. Almost as much as I love the Joy of Tech! I'll call that bet, Snaggy. Might as well, me as well. Sure I like poker too. I'll play. Sometimes you've just gotta say 'what the f*ck', and make your move. 'What the f*ck' gives you freedom, freedom brings opportunity, and opportunity makes your future.